Paytm and Yippee did a marketing deal of 250 Crore Rs to providing Free Recharge to Yippee customers from Paytm. 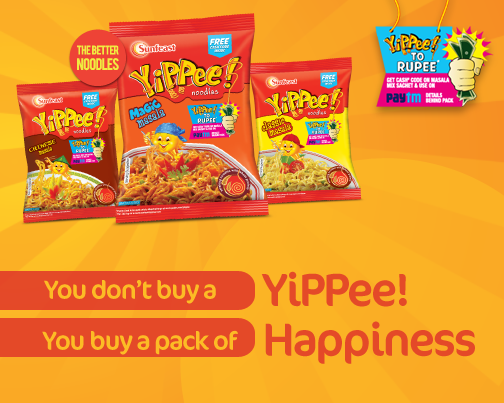 when you will buy a pack of Yippee noodles, on the masala pouch you will avail a coupon code, that you can redeem on the Paytm recharge website. The Campaign name is Yippe to Rupee offer. For getting the Paytm Coupon code, you have to buy Yippee noodles pack. I just bought a pack of yippee and got 10 Rs recharge. the recharge value can be from 5 Rs to 40 Rs. It's all depends on your luck. Subscribe us below via email to Get daily Coupon updates and FREE deals.